In this guide, we will be showing you how you can accurately measure a funny shaped room that might have angled walls that aren’t 90 degrees to each other. Accurately measuring a room is important to ensure you correctly show the proportions which will help with planning what you need to do in the room and surrounding area. Start by drawing the room on your notepad. Include all the elements you want to measure. A minimum I would recommend is the walls, doors and windows. Make sure you draw the room big enough to ensure you can easily add on measurements and notes. This will serve as our survey notes, we shall draw up a better version later. Once you have drawn the room up it is time to start measuring. The first thing we will do is choose the longest straightest wall as our first measurement. Using your tape/laser measure this will and draw the line on your bit of paper. Write the measurement of this wall under the line as follows. Now we have our first line we can use this to measure the remaining angled walls. In the example below, we will work clockwise around the room starting at the top left position. We are going to use a triangle method to work out the position. 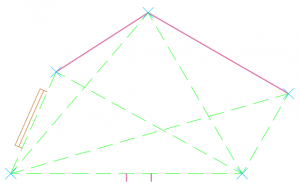 The principle is to measure the corner of a wall with enough points to make a triangle. In the example below, you will see what I mean. 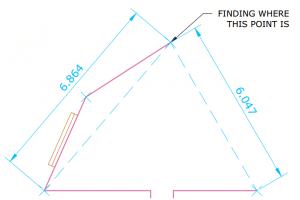 The purpose of using a triangle method is that we can use our drawing compass at a later stage to find this wall point. 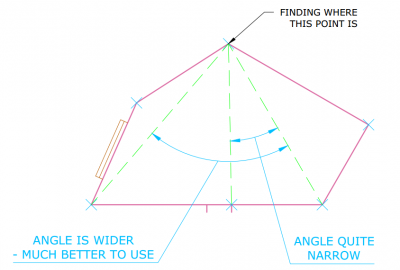 Use the triangle method to measure in the remaining wall corner points in your room. Make sure you always try to use the first line we measured as a source point for your measuring points. By always using this line you are minimising your errors. Once you have completed this you should have the following measurements (see green dashed lines). If you have all of these then we can proceed to the scaled drawing stage. In this section, we will explain how your previously surveyed notes can now be drawn on a piece of paper to scale. The same principles discussed here can be translated into AutoCad quite easily. For instance, instead of using a drawing compass you should use the circle feature to set a circle at the correct radius etc. Take a fresh piece of paper and decide upon a suitable scale to draw your room at. Perhaps a good scale to start with would be 5 cm on the page to equal 100 cm in real life. This scale would be called 1:20 as every 1 cm on the page would equal 20 cm in real life. When deciding your scale be careful to make sure your room will fit on the page and that it isn’t too small to be seen (too big or too small). Once you have decided your scale it is now time to grab your pencil, ruler and compass and start drawing your walls! Start by using your ruler to draw your initial line that you first measured. Make sure you draw the line to the correct scale. For instance, if you have decided on your 1:20 scale a 350 cm line would equal 17.5 cm on your page (350 / 20). Once you have drawn your initial line in we can grab our compass and start the process of drawing our angled lines in. If we start in a clockwise manner as per the image below. First of all start by using your ruler to set your compass to your first measurement at the correct scale. In the example below if we start with the line which we measured in at 687.7 cm. Set your compass to the correct size by scaling the line based on the scale you are using. In this example, the 687.7 cm line would equal 34.4 cm (687.7/20). Set the point to point measurement of the compass to 34.4 cm. Once you have set the measurement of the compass place one of the points on the starting corner (see below). The next step is to rotate the compass about this point in an arcing motion and mark the paper with this arc. Move on to the next measurement, in this example, the next measurement will be the one reading 361.7 cm. Like the step above, scale the measurement, set your compass to this size and then arc the measurement round in the approximate direction of the corner you are trying to find. Once you have done this correctly you will have 2 arcs that should cross over each other. This is the location of your first corner! To obtain the remaining wall corner points you would need to follow the process as per Step 5. Using this arcing technique to locate the point works well however try and make sure the points you are referencing from aren’t too close to each other in terms of the angle between them (see below). Once you have done this process for all the wall corner points you can now use your ruler to do a dot to dot exercise and join your points. You should now have a basic scaled wall outline of your room! Offering professional measured survey service for clients across London & The South East. We are renown for our quick turnarounds, easy to manipulate drawings and great customer service. We hope you found this a useful guide. If you have anything to add, leave a comment! What’s up, yes this piece of writing is really nice and I have learned lot of things from it about blogging.